Coptic Christians In U.S. Fear 'Terrible' Reaction In Egypt To Muhammad Film : The Two-Way The film Innocence of Muslims, which denigrates Islam and its prophet, Muhammad, has put the spotlight on a little-known community. Egypt's Coptic Christians have been coming to the U.S. since the 1950s, but are emigrating in greater numbers since the ouster of Hosni Mubarak last year. Father Mina celebrates the Christmas Nativity Liturgy, the start of Christmas, at the Coptic Orthodox Church of St. George on Jan. 6 in Brooklyn, N.Y. Coptic churches around the country have witnessed a surge of Christians fleeing Egypt since the start of the Arab Spring. The film Innocence of Muslims, which denigrates Islam and its prophet, Muhammad, has put the spotlight on a little-known community, Coptic Christians. "Coptic Christians belong to the Coptic Orthodox Church of Alexandria, the largest Christian church in Egypt. The church belongs to the Oriental Orthodox family of churches, which has been a distinct church body since the Council of Chalcedon in 451. ... Their history dates back 19 centuries and the language used in their liturgy can be traced to the speech of Egypt's pharaohs. "Once a majority in Egypt, Coptic Christians now make up about 10 percent of the country's 85 million people. They are the largest Christian community in the Middle East." The community has been present in the U.S. since at least the 1950s, says S. Michael Saad, chair, Council for Coptic Studies at Claremont Graduate University in Claremont, Calif. 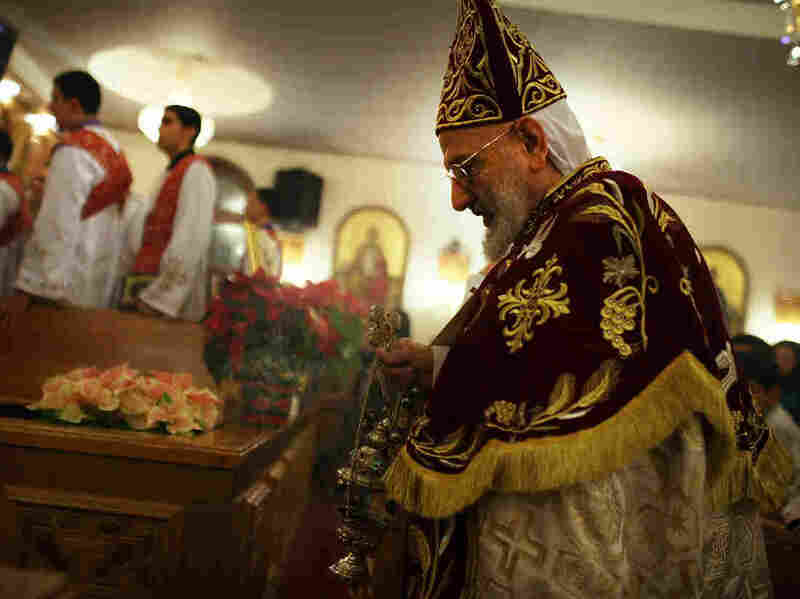 There are about 400,000 Copts in the U.S., and they have the second-highest number of churches in the country's Orthodox community after the Greeks. "They started coming in the 1950s after the Nasser revolution, when they were hit by both land reform and socialism," Saad tells the Two-Way. Saad says Coptic migration increased after the 1967 war with Israel, and in the 1970s when Anwar Sadat ruled Egypt. The period saw a rise of fundamentalist Islam, culminating in Sadat's assassination in 1981. His successor, Hosni Mubarak, clamped down on Islamists, and Egypt's approximately 8.5 million Copts were relatively safe during the next three decades — though the community did face violence and pressure. But ever since the ouster of Mubarak in 2011, and the subsequent rise of the Islamist Muslim Brotherhood as a political force, there has been a steady increase in Coptic emigration to the U.S. and elsewhere. "Numbers have greatly increased over the past 18 months since the so-called Arab Spring," Saad said. "We are seeing tens of families in every church every month." "Immigration lawyer David Barnett says most of his New York-based practice is now focused on Coptic Christians. Mr. Barnett is an observant Jew who prays every day. To accommodate his growing clientele, he employs a native Egyptian as a paralegal and works with a team of Egyptian translators. 'If they have money, they are getting out,' Mr. Barnett says." As NPR has reported in the past, the community has been the target of violence in Egypt. Saad says the community's situation now — after the movie — is more tenuous. "The reaction in Egypt is going to be terrible," he said. "Without movies, it's been miserable." Although the community is likely to feel safer in the U.S., Saad, in a paper published in Studies in World Christianity in December 2010, writes that it faces challenges here, too. "One of the serious challenges has been the age-old tension facing immigrant communities: maintaining a strong communal identity while dealing with the pressures of 'compromise' associated with assimilating into a new society," he writes. "An associated challenge is keeping most if not all second and third generations within the church."